Like all good things and the Superlative TV series before it, the Battlestar Galactica Exhibit is winding down at the Experience Music Project Museum in Seattle this on March 4, 2012. 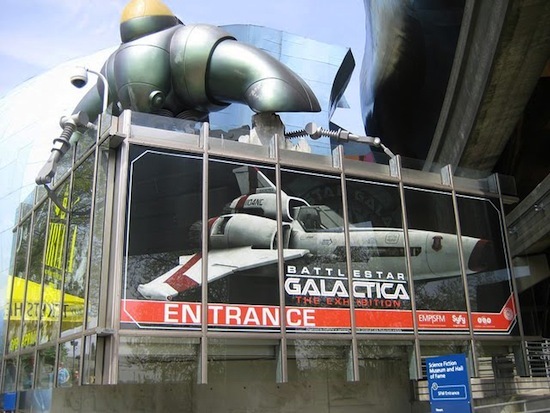 To commemorate the exhibit, the EMP museum is hosting Battlestar GalactiBash at Sky Church this Friday in conjunction with Geeks Who Drink and Geekgirlcon. Wear your Duty Blues and play a round of Pyramid with special guests including Tahmoh Penikett (Cpt. Karl ‘Helo’ Agathon), David Weddle (writer, producer), and Glenne Campbell (costume designer). Tickets can be purchased from Brown Paper Tickets.